A kitchen is constantly in use, be it for preparing meals for your family, or entertaining friends and guests. The way a kitchen is designed, therefore, plays a critical role in creating a lasting impression for the home overall. If you’re thinking of renovating your old kitchen and giving it a contemporary makeover, then you’re in the right place. For this blog post, we’ve put together some useful tips to get you started. The combination of stainless steel and white coloured items is one of the easiest ways to transform your kitchen into a contemporary one. They form clean lines that characterize a modern decor and helps in bringing a bold, contemporary edge to your kitchen. To explore multiple ways of incorporating stainless steel and white appliances in your kitchen, check out some ideas on Pinterest. While choosing stainless steel or white for your cabinets and appliances, make sure to add the playfulness of bold and bright colours. For example, you can selectively use tangerine orange colour in your all-white contemporary kitchen. Put white chairs at your white kitchen island or dining table. Add a tangerine countertop and light shade to complete the look. If you like the colour green and want to revamp your old wood cabinets, you can paint them with a warm yellow-green colour. Leave the walls, backsplash, and countertop white for the ideal visual charm. However, if you’re fond of cooler tones, think of colours like cobalt blue or ice green. Open shelving is a trend in contemporary kitchen design. Instead of stacking your prized items such as dishware, crockery, glass sets, and other items, in a closed cabinet, display them on open shelves. The shelves make your kitchen look more open and brighter. Utilize your unused corners or the wall near the sink to install your open shelves. Choose materials and finishes that complement the rest of your kitchen. 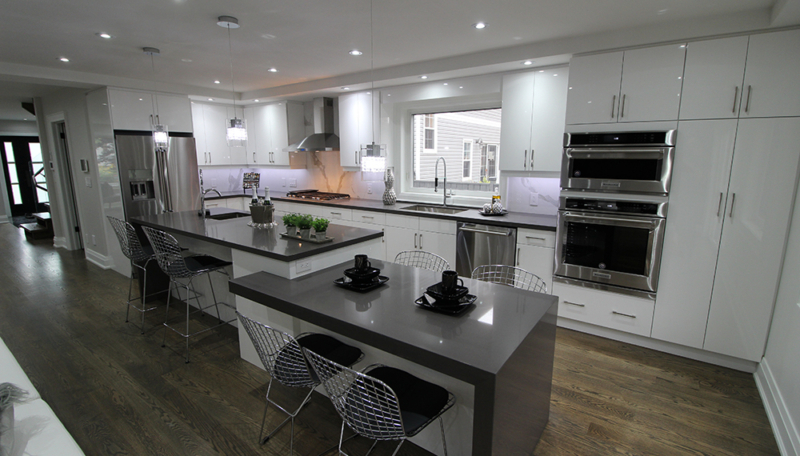 One of the easiest ways to give your kitchen a contemporary makeover is to upgrade to contemporary kitchen cabinets. Opt for slab door or drawer style that has no trims or frills. It can either lie over the cabinet covering the boxes or have an inset construction. In inset construction, the edges or the frames of the cabinet boxes are visible and these days, inset is contemporary. For the cabinet hardware, replace old knobs and pulls with contemporary channel pulls or streamlined bar pulls. Stainless steel and chrome make the ideal choices for contemporary hardware. If you have the budget, replace your old rustic style wooden floor or vintage style floor tiles with a floor material that has subtle or no patterns. For the backsplash, select glass tiles, aluminium, stainless steel, acrylic or ceramic tiles with a clean uniform look. White and neutral colours make ideal choices. Make sure that they complement your kitchen’s contemporary colour scheme. Add modern lighting across your kitchen island and under the cabinets. There are several ways in which you can transform your old kitchen into a stylish contemporary space. Follow these tips and witness the amazing transformation of your kitchen! For all your kitchen renovation and remodelling needs, contact Euroline Kitchens Ltd. We’re dedicated to providing 100% customer satisfaction through our excellent project management and workmanship.